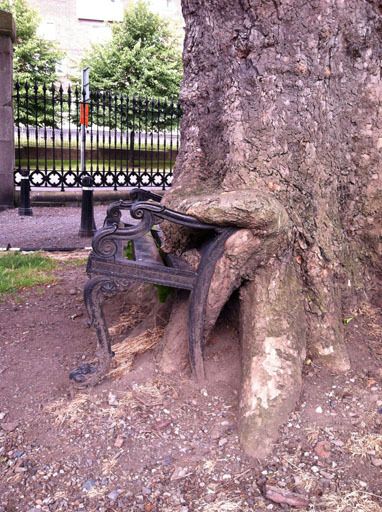 Dublin has many famous landmarks, but one that should be more famous is the “Hungry Tree,” which is slowly digesting a park bench. In the grounds of the King’s Inns, the training ground of centuries of Irish lawyers and barristers, stands a vast London Plane tree of unknown age. 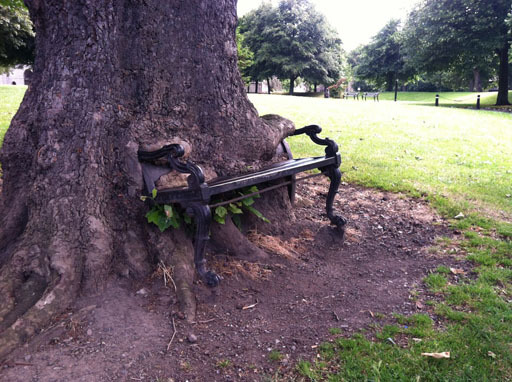 Although listed as one of Ireland’s Heritage Trees by the Tree Council of Ireland, but its real claim to fame is the park bench it’s been slowly swallowing up over time. The steel bench is now firmly lodged within the tree’s bulk, and visitors love to take pictures of themselves on the bench being “eaten” by the tree. 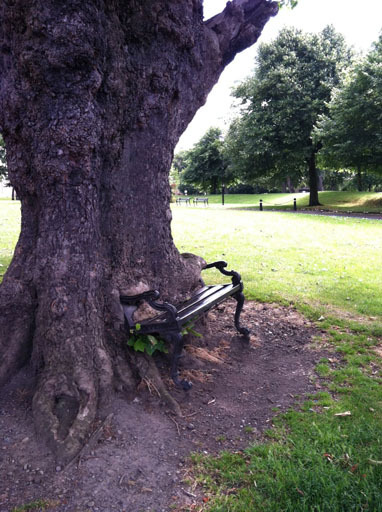 Local slang refers to Irish barristers as benchers, but whether that is because they like posing on this bench while attending the King’s Inns as students, or because people wish the tree would eat a few of them as well as the bench, is unclear. Since the Lord of the Rings films vividly showed us the Ents fighting Orcs and throwing boulders around, children can be forgiven for initially keeping their distance from the Hungry Tree, as it does look as if one of Tolkien’s fantasies has come to life. But, most will quickly warm to the sheer oddness of the spot, and can’t wait to tell their friends about the “tree that ate a bench” on their return to school. In a city full of museums and galleries, the ‘Hungry Tree’ is a whimsical and memorable detour for the whole family.